Worry not. I’m here to help. 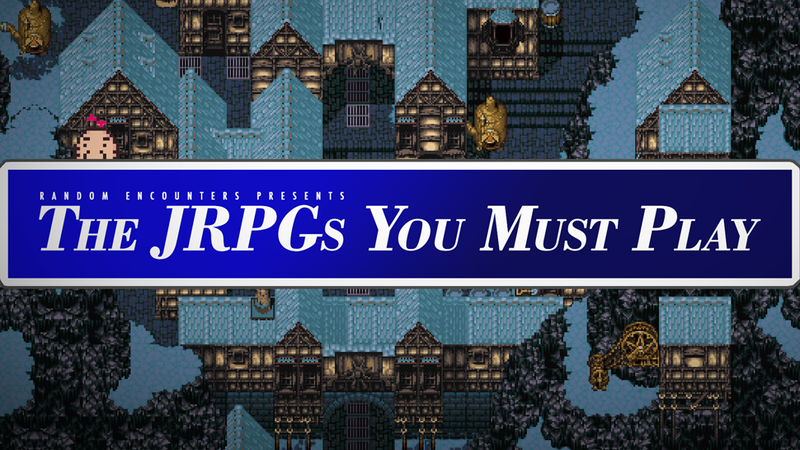 This is a list of Japanese role-playing games that deserve your time. Some are new; some are old; all are excellent. Each of these is worth playing today, even if you have to dig out your dusty old Super Nintendo and try to find cartridges at a yard sale. These are games both timeless and ageless. They’re the cream of the crop. They’ve got the spikiest of the hair. The longest of the swords. The evilest of the demons. This article was originally published in 2013. We’ve revised and bumped it up again for 2018. Back in the early 90s, a small company named Quintet released a handful of actiony RPGs for Nintendo systems. Many are very good—ActRaiser, Soul Blazer, Terranigma—but the highlight is Illusion of Gaia, a quirky romp in which you play a psychic boy named Will who has to travel across a twisted version of the real world, hacking his way through both fantasy tropes and actual landmarks like the Great Wall of China. Will’s journey is satisfying and surprisingly touching, filled with little lines and moments that touch upon mortality and the meaning of life. No game has mastered the concept of traditional JRPG—a turn-based, music-heavy adventure filled with interesting people and places—quite like the Lunar series, created by the talented team at a Japanese studio called Game Arts. Eternal Blue is the best of the bunch, and although the hero, Hiro, can get a little grating, the game is warm and lovely and surprisingly genuine. Killer soundtrack, too. If you look up the word “charming” in the dictionary, you will probably not find Ni no Kuni. I don’t know why you thought a niche role-playing game would be mentioned in a dictionary. But Ni no Kuni is an excellent game nonetheless—a gorgeous, funny adventure that’s essentially an explorable Miyazaki film. (Read my review.) The sequel is also worth playing, and has a drastically improved combat system. Back in the 90s, when Final Fantasy had exploded and JRPGs were as ubiquitous as MOBAs are today, Sega offered up their own take: Phantasy Star, a sci-fi epic that would be to Star Wars what Dragon Quest was to Lord of the Rings. While some naysayers and Nintendo fanboys dismissed Sega’s series as a bunch of knock-offs, people who actually played the Genesis RPGs were treated to some high-quality sci-fi RPG action. Phantasy Star IV in particular is transcendent. In this game you get to have a slap fight on a giant cannon. There are games that make sense, and then there is Xenogears, a sprawling epic about giant robots and religious mythology that somehow manages to be simultaneously poignant and incoherent. If you can look past some subpar dungeon design and excruciatingly slow text, you’re in for a wonderful adventure about people fighting the odds—and giant robots—to save the world from what may or may not be God Himself. Yes, Nintendo’s cult classic is as good as everyone says it is. Yes, it’s quirky and funny and full of memorable moments. No, it’s not really about a fetus. Radiant Historia is like a Chrono Trigger for the modern age. You know—time travel, strategy-packed combat system, lots of melodrama—the works. It’s pretty great. How many RPGs let you play as Mario in the Mushroom Kingdom? Well, okay, a lot these days. But Super Mario RPG was the first and is still one of the best, and it’s the only RPG with a weapon that lets Bowser hurl Mario at enemy Koopa Troopas, which is pretty much all you need to know. Smart, clever, and remarkably well-written, the ninth Final Fantasy is a Shakespearean romp with more humor than you might expect from a game about a thief in love with a princess. The random encounter rate is way too high, but just about everything else makes up for that. The best of the Dragon Quests is cel-shaded and goofy and full of charm. If you don’t mind silly accents and a bit of level-grinding, you’ll dig it. Video games love to glamorize warfare, but in Final Fantasy Tactics, war is real and unpleasant—if you look past the fact that it’s conducted by magicians in funny hats. FFT is a game full of death, betrayal, and bad news for all, unless you are the player, in which case you will love the hell out of the game’s elegant job system and addictive grid-based combat. If you don’t spend too much time thinking about the convoluted mess that Tetsuya Nomura calls a plot, jumping and slashing through Disney worlds is really quite fun. Back before Hironobu Sakaguchi’s Mistwalker got trapped in the quagmire of mobile gaming, they made a few fantastic role-playing games, including the Microsoft-exclusive Lost Odyssey, which is easy to play today thanks to the Xbox One’s backwards compatibility. With a fascinating story surrounding a squad of amnesiac immortals and some solid old-school mechanics, Lost Odyssey is still well worth your time.